Another hat made starting from the pdf I've talked about in this other post. This is the no. 15, but as always I've made some changes to make it more personal. I've added a contrasting colour, earflaps and a flower on a side. It was fun and quick to make, and I'm again in love with making hats thanks to this pdf! The yarn is a mix of wool and cotton and it's so soft, and I like the colours as well. Thanks for stopping by my blog, I hope you enjoy my creations! This is my crafty blog. Here you will find all my crochet, knitting and sewing original designs, free patterns and, I hope, inspiration for your creativity. 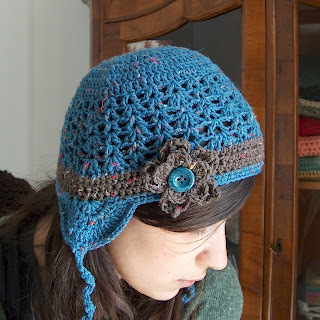 Please read THIS POST about how to use my free patterns.